Prepared by Community Alliance for Global Justice Intern Jordan Beaudry. CAGJ’s Food Justice Project has adopted genetically engineered seafood as our 2015 Local Producers Solidarity Campaign. In partnership with Friends of the Earth and others, we are demanding that Costco, headquartered in Issaquah, WA, commit to keeping GE salmon off their shelves. Over 9,000 retail stores nationwide have signed Friends of the Earth’s Pledge for GE Free Seafood, codifying their commitment not to sell modified fish. Many major retailers, such as Trader Joes, Safeway, Kroeger, and Whole Foods, are on board. As the nation’s second largest retailer, Costco is one of the most notable holdouts. It is imperative that Costco help set a precedent by saying NO to GE salmon before the FDA says YES. The FDA is in the final stages of negotiating the approval of the “AquaAdvantage” GE salmon. The “AquaAdvantage” salmon, created by biotech company AquaBounty Technologies, combines DNA from Atlantic salmon with a growth-hormone gene from Pacific Chinook Salmon and another gene from an Ocean Pout. The resulting concoction is a man made species of salmon that grow twice as fast as their natural counterparts and can breed year round. Although genetically modified components of processed foods have become common in American markets, there are very few whole GE products for sale. Allowing these fish to be sold in in American retail chains would set a problematic precedent, likely resulting in an influx of unlabeled, modified meat. The AquaAdvantage salmon is the first of at least 35 species of modified fish being developed. There are also plans to engineer pigs, cows and chickens. The commercialization of GE salmon would represent a serious assault on the notion of food sovereignty. CAGJ’s AGRA Watch project has recently started working on a campaign to end the Gates Foundation’s funding of the GE banana, in solidarity with Ugandan activists concerned about its pending introduction to their country, where bananas are centrally important to the diet and culture. The reasons for opposition to GE foods and crops are common to both of the campaigns AGRA Watch and the Food Justice Project are currently undertaking. Genetic engineering is not necessary to supplying human nutritional needs anywhere in the world. The careless introduction of this practice internationally and at home raises legitimate concerns about unassessed health and environmental impacts. Genetic engineering is largely conducted by for-profit companies and the process is not subject to any democratic oversight. For over three decades, consumer and environmental activists have been opposing the introduction of GE foods without adequate safety assessments regarding their potential effects on human health and the environment. International norms urge all countries to perform such assessments. However, the federal government has long ago acceded to the demands of the industry and does not conduct such evaluations, usually merely rubberstamping all industry proposals that are submitted (in the case of the FDA, voluntarily submitted, since there is absolutely no regulatory oversight). Because, in part, the GE salmon would represent the first engineered animal for sale commercially, opposition to its introduction has been very fierce and the FDA has been forced to require the corporate sponsor to address concerns that have been raised. Nonetheless, the final documents are woefully inadequate in this regard. 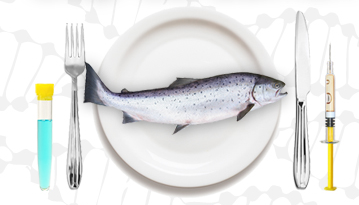 In December 2012 the FDA released a report that concluded GE salmon posed no risk to human health or the environment. These findings, which relied exclusively on data supplied by AquaBounty, are a major step towards the FDA approval. Unfortunately the FDA overlooked substantial evidence in the creation of their report. Compared to non-modified salmon the AquaAdvantage breed have 40% higher levels of the hormone IGF-1, consumption of which has been associated with various forms of cancer. GE fish are also more susceptible to disease than their natural counterparts. Factory fish farms tend to rely heavily on antibiotics and other chemicals to control disease in their populations. Chemically treated fish are proven to adversely impact human health. An increase in diseased fish is likely to cause wider use of antibiotics and other harmful toxins. GE salmon would constitute a significant threat to the ecosystem if any were to escape into the wild. Researchers have concluded that 60 GE salmon could displace a population of 60,000 non-modified salmon in a span of 40 generations. They have further potential to reduce biodiversity through breeding their modified genetics into natural populations, thereby eradicating the gene pool of local species. This could have devastating impacts on our environment and global food supply. A poll commissioned by Food and Water Watch shows that 91% of the American public does not believe the FDA should allow GE fish into the marketplace. In order to protect our national food sovereignty it is crucial to persuade grocers to stand with consumer health and safety. CAGJ will be holding a demonstration at Costco’s South Seattle location from 2pm-4pm on Saturday, March 7th to inform customers of the risks posed by GE salmon and presenting petition signatures demanding Costco endorse the Pledge for GE Free Seafood. Please join us on this day to take a stand against modified meat!